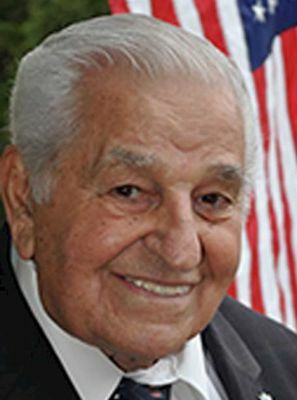 Cedarhurst’s Andrew J. Parise, who served the village for more than 43 years, first as a trustee and then for nearly the past two decades as mayor, died at his home Sunday of natural causes. He was 90. Parise was a World War II veteran who joined the Army at 18. He served with the 312th Engineer Combat Battalion, 87th Infantry Division and in December 1944, fought in the Battle of the Bulge, where he was wounded after fighting 154 days on the front lines without relief. He received the Purple Heart and three battle stars, and his unit later liberated the Buchenwald concentration camp in east-central Nazi Germany. After the war, Parise took on various jobs, and in 1954 became a legislative aide to state Assemb. Edward Larkin, a Republican. In 1956, he joined the Town of Hempstead as an executive assistant. He set up the first department of purchase for any town in the state and became its first director in 1958. Parise was executive assistant to seven town chiefs. In 1963, he founded the Town of Hempstead Employees Federal Credit Union and was the first account holder. “As soon as he became mayor, he took an overgrown, desolate park and made it come to life,” said Sal Evola, a 54-year resident who is the village administrator. Evola added that Parise would drive through the village daily, taking note of dead trees, lights that were out and garbage on the sidewalk. Nassau County Executive Edward Mangano and State Sen. Dean Skelos (R-Rockville Centre) both called Parise a friend, as did Hempstead Town Supervisor Kate Murray. “Andy’s entire life was the epitome of public service,” Skelos said. Survivors include sons Andrew Jr. and David, both of Manhattan; a daughter, Louise Anne Bencal, of Hamilton, New Jersey; 10 grandchildren and five great-grandchildren. Parise’s wife, Lillian, died in 1994. A wake will be held Wednesday and Thursday at Perry Funeral Home in Lynbrook from 2 to 4 p.m. and 7 to 9 p.m.
A Mass of Christian Burial will be celebrated at 10 a.m. Friday at St. Joachim’s Church in Cedarhurst, with burial to follow at Greenfield Cemetery in Uniondale.